Tesco has a real chance at reinvention. Hiring Unilever lifer Dave Lewis to replace Phil Clarke as chief executive provides a golden opportunity for an outsider to apply radical thinking to solving the UK supermarket group’s mounting problems. This is a monster of a company which is diverse in its geographical footprint and business activities. Two-thirds of its revenue comes from Britain, and it generates most of its income selling household basics such as beans and dishcloths. But Tesco has shops in South Korea, Thailand and the Czech Republic. Moreover, it has a bank and, with its iPad-like Hudl tablet, is a wannabe-technology play. Diversification provides opportunity. Tesco has a near-30 percent market share of the UK grocery market. It would be hard to generate sustained long-term growth if it shrank back to its core. Under Lewis, however, Tesco has to prove it has the breadth and depth of management talent to pursue a diversified strategy. Does the top brass have too many distractions? If Lewis finds himself answering “yes” to that question, Tesco should simplify further. It is more important for the group to protect its domestic market than explore new ones. Tesco continues to lose share at home. Lewis must win the UK supermarket price war. He is a branding expert. That will help. But customers are more likely to open their purses if the company cuts prices further. Under Clarke, trading profit margins fell to 4.6 percent in the last full year from 5.2 percent in 2012. It might be necessary to let the number fall at least another percentage point. A new CEO may have more backing from investors in pursing such an expensive tactic. The profit warning that accompanied news of Clarke’s exit highlights the urgency of the situation. The fact that shares rose in spite of the warning suggests investors are hopeful that Lewis can turn the retailer’s fortunes. Tesco grew handsomely in the 20 years to 2010, and scale carries obvious advantages. Lewis should take note of the warm reception – and use the honeymoon to make some tough choices about fulfilling Tesco’s potential. 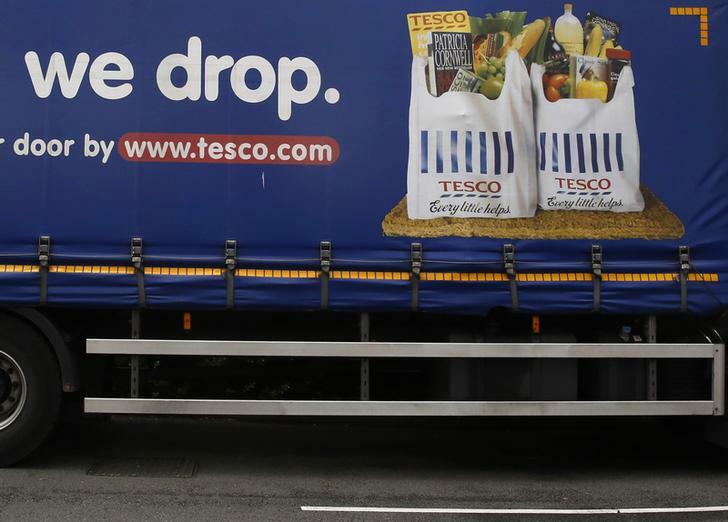 Part of a slogan is pictured on the side of a Tesco supermarket delivery truck in New Malden southwest London June 4, 2014. Dave Lewis is to replace Phil Clarke as chief executive of Tesco, the UK-based supermarket retailer said on July 21. Lewis is employed by Unilever, the household products company, as president of its personal care subsidiary. He will take over from Clarke on Oct. 1. The directorate change came as Tesco issued another profit warning. Shares in the group were up 2 percent at 290.8 pence in lunchtime trading in London.